The Cryptologic network is no longer running as a poker network. 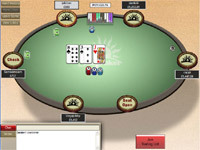 It now simply provides software for a very small number of online Casinos. Network traffic: It was average to low. Cryptologic merged with the Boss Media (now the IPN network) in early 2009. Many of the rooms that remained on the Cryptologic network at that time either went along with the switch to the IPN network or moved to a different network like iPoker. The Cryptologic network experienced a decent amount of traffic back in its prime, which was probably around 2007. I would liken the popularity and player volume at Cryptologic at that time to the current Merge network. Not a huge amount, but enough to keep the tables busy at the popular stakes. Cryptologic was a lot like the Merge network of today, just with worse software. Things started to go downhill after a number of the major skins on the network moved elsewhere, which meant that the player traffic took some pretty big hits. Over time the player volume became smaller and smaller, until it was announced in late 2008 that the Cryptologic network would merge with Boss Media. What was the Cryptologic software like? It wasn't great. From what I remember the graphics were very basic and the software wasn't the best constructed I had ever seen. The software was playable, but it wasn't "well-finished" and wasn't a sleek client overall. Some players didn't mind the simple software, but it was too archaic for most. 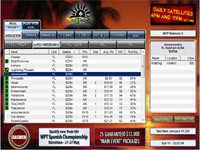 Below are a couple of screenshots of the Sun Poker room (now iPoker) when it was on the Cryptologic network. What rooms used to be on the Cryptologic network? That's about as good as it gets. There were a lot of small-name rooms on Cryptologic, which is the reason why it never really took off. Go back to the illuminating poker networks page.